HOMILY FOR THE 27TH SUNDAY IN ORDINARY TIME--10/3/10--BEGINNING "RESPECT LIFE MONTH"
Statue of St. Francis of Assisi, in Assisi overlooking Umbria. A. At the beginning of Respect Life month, we are really fortunate to also celebrate the Feast of St. Francis (Oct. 4) who taught us how to be joyful and faithful to Christ and his teachings. You know, St. Francis was absolutely faithful to Catholic teaching. Sometimes we forget and think that his being Catholic was incidental to his sainthood but it was not. He was joyful, fun, and filled with life precisely because of the truths he held with his Catholic faith. His reverence for all of creation–that is essential Catholic teaching. His love of people and his insistence that each person’s dignity be recognized and honored –that is essential Catholic teaching. B. I’ve told you many stories about him. Three years ago, I told the most famous one–The Wolf of Gubbio. Then there’s the story of his preaching to the birds. Then there is the story of his traveling to see the Sultan of the Holy Land to preach to this Moslem King about the power of Christ. Then there is the famous story I told you about his meeting a leper. Many stories, all about his reverence for life because of the dignity that Christ gave all creation–especially humanity. A. But in our day and age, it is easier to hug a wolf, or kiss a seal, or wish Keiko the Killer Whale happiness in the next life than it is to help the poor, save the life of the unborn, protect the aged and ill. Francis taught us that God wanted us to reverence all life, but particularly human life. What have we become when the plankton in the ocean is deemed more precious than the person in the womb? What does it say about the value of a human person when we weep for the passing of the spotted owl but do not shed a tear when a doctor decides to end the life of a patient, or a son or daughter wishes to end the life of an aged mother or father? What do we really value when we pass stringent laws on littering and air pollution and make legal the killing of near term babies in partial birth abortions? Our Congress will argue for months about whether the caribou will have their view impaired or their environment harmed if we drill for oil in the Arctic. But tell them to keep researchers from raising human embryos only to harvest their stem cells or body parts for others and that is seen as somehow infringing on human choice. St. Francis said all life must be reverenced–to treasure and take care of the earth and environment is important–that’s Catholic teaching, but he also taught, as did Christ, that nothing is more valuable than a human person, a human being, a human life. B. The Gospel of Life that we preach is a joyful one. Sure we say no to abortion, and no to euthanasia, and no to the oppressing of the poor and abuse of children–but in this case, saying no is the joyful, truthful, right thing to do. It’s counter-cultural, but it’s what we must do. Did you hear St. Paul talking to Timothy today? He said, "I remind you...God did not give us a spirit of cowardice, but rather a spirit of power and of love and of self-discipline. Do not be ashamed...join with me in suffering for the Gospel...hold to the standard of sound teaching that you have heard from me." Sure we like St. Francis today–but when he lived, he suffered for teaching the truth. C. Many of us get sucked into the sympathy argument. Because Christopher Reeve or Michael J. Fox, faces we know and love were or are suffering, we are more willing to see unnamed and unseen human embryos die because we think we can use their parts to help heal others. But you cannot sacrifice one human in order to save another. You can’t make one life more important. Jews must die for the sake of the Aryan race. That’s what Hitler said. Christians and other non-Moslems must die so that Allah will be happy. That’s what Osama bin Laden says. The tiniest of human life whether in the test tube or the womb can be killed for the greater good of humanity. Old people can be killed if they pose too great a burden on society. And now the Netherlands says that even children can be killed if they’re really sick. That’s what modern medical research is saying. We can rationalize all we want, but the good God who created all creation will not let this stand, nor will he open heaven’s gates to anyone who knowingly and willingly promotes such things. DON'T MISS THE BEST DRAMA ON TELEVISION! SMALLVILLE'S FINAL SEASON ROCKS! I've written about this series before, but in its tenth and final season, SMALLVILLE will bring to the close the coming of age story of a young man who happens to be the world's hero. It's all about what it means to be human, and where true power lies, and the importance of family and friends. 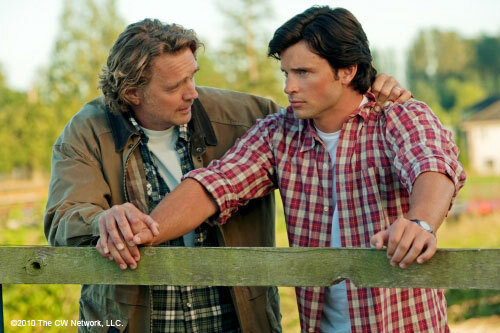 The above image heralds the return--albeit in a vision--of Jonathan Kent, Clark's foster father who died on the series five years ago. In an interview, not long ago, John Schneider, who portrays the elder Kent, said he was always honored to play this character and felt it was the best one he has ever had the privilege to portray. His quote, "I only hope I could be half the father Jonathan Kent is." The world is a little short of great father images--he's welcome back to the final season. The show premiered last night to great reviews and a great audience. Call me a sucker for sci-fi, but the Superman story with its obvious Christological overtones--themes the television show exuberently displays--is a hopeful tale in the midst of a very dark age. Watch and enjoy. A. When I was a kid, I would go into the woods because I knew they were holy. Just out of my eyesight, just around a bush or an oak, something wonderful existed. The woods always turned my heart to God. Once, I even remember building a shrine to God out in the woods. Whatever stirred in the hearts of the ancient pagans stirred in mine as a child, for I knew God was near. And I think I even told you once how I would sit in a tree out in the middle of a cornfield as a child and pray the Rosary. I could see for miles, and on beautiful spring, summer, and fall days, it was just a holy place. B. One line leapt out at me from the Gospel today. It’s Abraham’s answer to the Rich Man’s plea that he send some sign, even someone from the dead to help convert his brothers so they won’t end up in hell like he is. And Abraham says, "They have Moses and the Prophets, that should be enough for them. For if they don’t believe what their religion teaches, they will not believe even if someone should rise from the dead." 1. We all want God. But so many have so much trouble believing. I see this most often in funerals. Nowadays, when I celebrate the funeral Mass, many in the congregation look blankly at me. "Give us hope," they say. But we speak different languages now. They are no longer familiar with the Bible, with the Catholic faith, with Jesus. And talk about resurrection and life conquering death, while it seems vaguely familiar to them, doesn’t really touch them. Jesus, himself, could appear before many people today, and I fear that few would believe. You can’t reconginze truth unless you have learned what truth is. 2. I don’t want that to happen to you or to me. That’s why I do what might seem like strange things to you–like blessing St. Michael’s Bread, talking about angels, encouraging people to bring their pets to the Pet Blessing in honor of St. Francis of Assisi. That miss the many splendored thing. 4. What does that mean? Well you might remember that one of the essences of Celtic Spirituality is to see the holy in the ordinary. That’s what I’m talking about. The Catholic thing is to become super aware of the glory of God’s creation, to realize that we are not alone, and to do what we can to always bring to mind that the world and the universe is more awesome than we know. A. This week we celebrate the Feast of St. Michael, St. Raphael, and St. Gabriel. Michaelmas, this feast was always known as. And when the Church calls this feast to mind, its doing exactly what I did when I was a kid–helping us all see that the holy is in our midst. If you look around the world at the shrines dedicated to St. Michael, they are almost always high places. Mount Gargano in Italy, Mont St, Michel in France, Skellig Michael off the coast of Ireland. St. Michael is the one who in our tradition leads the souls of the dead to God, and in his holy places, and they are many, the walls between the worlds are thin, and you get a sense of the divine. This feast is in the dying time of the year, and yet it celebrates the harvest–the fruits of the earth that give us life. B. The Feast of the Guardian Angels is just around the corner. The belief we have that each of us has an angelic guardian is not just a child’s fantasy. Jesus himself teaches us this truth. III. When We Are Aware Of The Holiness Of The Everyday, We Are Much More Open To Believe In the Risen Jesus. A. In the next week, we are going to be doing things that bring to our daily lives, the reality of God in our everyday existence. My message is really simple this week. Start recognizing the presence of God every moment of every day. B. The autumn is a great time to do this. Don’t be like the Rich Man, who was so consumed with worldly things that he forgot to realize that God was near. If we surround ourselves, blockade ourselves from God, then God will not be with us when our lives end. On the other hand, if we recognize the presence of God and put traditions and celebrations in our lives that bring home that presence, then sickness, suffering, and death will not be the overwhelming darkness that we all fear, but a doorway through which we walk to the undying fields of the Lord, where the leaves are golden, where death casts no shadow, where the sun shines warm, where Christ himself welcomes us home. Say a prayer for the Pope as he begins his trip to Scotland and England tomorrow. Brother Corman had come home to the island monastery of Iona after a long time trying to spread the Gospel to the pagans in southern Scotland. And the monks were glad to see him. He had been gone a long time. But something was wrong. The Abbot said to him: "Corman, my good friend, you look tired from your long journey, and you look sad, as if some great tragedy had fallen upon you. Come and rest yourself and tell us all that has happened to you in your missionary journeys." And Brother Corman spoke, and his words were full of bitterness and wrath. "I have failed to convert the pagans. I left here with high hopes and a brave heart knowing that if I just spoke the Word of God, the towers of sin would fall and those cast adrift on a sea of sin would find a safe anchor by the Cross of Christ. I traveled over the hills, through the heather and by the stream and talked to all the people of that land and tried to grab them from Satan's power. I told them of the wrath of God, that he hated their lusts, and their violence, and their idolatry, and that God was very angry with them every day for all their wickedness. I told them too of that vast eternal pit of hell where lost souls in heat and cold are leaping to and fro in silent agony, suffering for their sins. They didn't listen to a word I said. They mocked me and despised my words; and now I have come back. Such hard-hearted idiots do not deserve the grace and help of God." So bitter were his words, that the monks were stunned into silence. Then Aidan spoke, and with words kind, but with words strong he gently but firmly responded to Corman's hardhearted judgement on the people of southern Scotland. "Corman, my friend, you don't feed steak to a baby; at first, you feed milk. I wonder--did you tell those people of the love of Christ, so wide and free that even the universe cannot contain it all, a love that caused Christ to feel great grief for us, chained as we were by sin and sorrow? Did you tell those people of that love of Christ that caused him to pray for those who did him wrong and caused him to give his life as a ransom for us all? The love of Christ--thatwins and conquers all! I'm not blaming you Brother Corman, but I think it was your method, not your message that failed." And the Abbot of that monastery thought that perhaps Aidan was the man for the missionary task, and so he sent Aidan forth into the wilderness to talk to the pagans saying, "Go, Brother Aidan, in God's name and try the gentler way of drawing those to Christ that are astray. The stubborn colt is trained more easily by soft and coaxing words than by hard blows." And so Aidan went, and wherever he went he lifted up the Cross of Christ and said almost the same words as bitter Brother Corman. Aidan said, "Repent for Christ has come! Renounce your idols, your lusts and your violence for the only Son of God has come from heaven to save you from the pains of death and hell!" But though he spoke the truth, it was what he said after that made them accept Baptism. "How can you turn away from Jesus," he said, "how can you turn away when he who did so much for you, whose precious life he gave for you that you might live for evermore, how can you turn away when Christ calls you back with mercy? Come home--come home to Christ, for the day is short; the night is coming on; the accepted time is now." And so the people came for Baptism; they came not out of fear, but out of love for the merciful Christ that St. Aidan preached. And that is why, my friends, the truth must always be spoken, but it matters how it is said. There is a hell and there is damnation, but the God who condemns weeps for those who are there. For heaven is our home, and mercy waits for us if only we choose to accept Christ's love. God wants us saved. A. The story of St. Aidan is a good one to show how these readings today are put into practice. To think that God is just a marshmallow God, all squishy and weak, ready to give us heaven no matter what we do, is wrong. But it's just as wrong to live our lives in fear that God can't wait to send us to hell. The mercy of God is real and it is that tremendous love that ought to make us want to be good. B. Fear only gets us so far. I think you know me well enough to know that just saying those truths like missing Mass deliberately is a serious sin, or obey the Ten Commandments or your soul is in peril--just saying those truths isn't enough. I have to tell you the greater truth, that Christ loves us and wants us to follow him, that Christ loves us and wants us to put aside our sinfulness and really live in joy. Yes, if we don't live right we really will end up in hell, but who wants to think about that, who wants to live with that as the main reason to be good? I want to think about God's love and I want to do good because Christ is my friend and I want to be by his side and when I do evil I can't be by his side. GOD LOVES YOU AND WANTS TO FORGIVE YOU. DON'T RESIST HIS LOVE. D. St. Aidan knew that just like you catch a lot more flies with honey than with vinegar, you catch a lot more sinners with a promise of God's mercy than with threats. Remember what he said: "How can you turn away when Christ calls you back with mercy? Come home--come home to Christ, for the day is short; the night is coming on; the accepted time for repenting and receiving God's mercy is now." Some obscure, self-ordained minister named the Rev. Terry Jones, from Florida, has just elevated his congregation to the center of an international incident. He intends on September 11, to burn copies of the Koran to show his disapproval of the religion. General Petraeus has begged him not to do this since it will endanger our service men and women serving in the field, but that hasn't moved the reverend. I have many problems with radical Islam which has hijacked a faith that has many fine adherents. To insult and disgrace a faith's holy book is a decision that has little sense to it. Many Islamists do not respect the Bible. Just find out how easy it is to get a Bible into Saudi Arabia, but bad behavior on one side does not justify it on the other. The Koran states its respect for Christianity--we ought to follow the example of the Pope and give it the same respect. A. Today, we are talking about choices and the consequences of choices. Sometimes, Christ is like a mysterious stranger to us. We follow him because he intrigues us, not because we are committed. And when we are forced to make a choice, we often return to our comfortable life styles. It was that way with the people who first heard Jesus. First, the crowds were large. But I bet they got a lot smaller when he said, "To be my follower, you have to hate your father and mother, wife and children, brothers and sisters." I bet they got even smaller when he said we have to renounce all our possessions. Now remember, when Jesus says "hate" he is using the word in the sense of neglect, or putting in second place. In other words, he wants all relationships and possessions to take second place to him. B. Then Jesus tells us that just like people who build buildings, or kings who go to war, we have to count the cost of our commitment to him and realize that we are going to hurt, suffer, and be in some pain in order to reach our goal with him. He is saying, "To choose is to lose." By that he means, all choices mean giving up something else. You can’t have everything, and when you choose, your options shrink. One’s private choices have public consequences. That’s why when we choose, we ought to know what we are choosing, what the cost will be and embrace that choice willingly knowing that by choosing to be one thing we will not be able to be another. 1. Kids discover this early on. John, you have a choice, soccer or football, but not both. Sally, it’s dance or girl scouts but not both. 2. College students figure out that money and job satisfaction don’t always go together. Math may be your specialty–you’ll make a ton of money being a corporate accountant, but maybe your first love is teaching kids the beauties of numbers–less money, more fulfillment for you perhaps. But you can’t be both. Since you will lose something in the choice, choose to lose what means less to you. 3. People my age, and that means most of you, are hit with the what if syndrome. Now more than ever, we face the consequences of choices we made years ago–our choice of spouse, our choice of job, our choice of life style. Every choice we made narrowed down our options. Did we choose wisely? Hopefully yes, but if not, start now, it is not too late. I’ll make a little confession to you: Sometimes, I wish I could live a little more radically, without following all the rules, without worrying about morality, about what people would think or say. Sometimes, I envy people who don’t have a true moral compass. And then I remember my choice. Long ago, I chose to serve God–you are probably thinking that I mean choosing to be a priest. No. Long ago, I chose to serve God just like you chose, through those countless choices to pray or not to pray, to go to Church or not go to Church, to receive Jesus in Communion or not receive Jesus in Communion, to be confirmed or not to be confirmed, to follow Christ or not follow Christ. And each time I chose, my options to do evil, to do wrong, to do my own thing became more limited. The more I chose Christ, the more I had to act like Christ. I’m far from perfect and I have a lot more choices to make, but I find at this age in my life there are some life styles, some moral choices, I can no longer choose because to do so would make me walk away from Jesus. To choose is to lose, and though I sometimes wistfully wish I could do what other people do without thought of moral consequences, I know that if I did I would lose Christ, and that’s a choice I will not make. I love him too much. C. I go through this with you, because I bet you think the same way. That’s what Jesus is talking about in the Gospel, realizing that if we choose him, things won’t always be easy and we will not always have the easier road. The main point of the homily is simple: To choose is to lose, so count the cost and make sure you choose what is good and lose what will make you less a person. This Gospel makes a lot of sense. Stay distant from Christ, and he will simply be a mysterious stranger who asks impossible things. When you receive Christ today in the Eucharist, ask him to be your friend. It does no good for us to come close to death and whisper, "If I would have walked with him, I wonder where he would have taken me?" Walk with him now and see where he takes you. Love him now, and live forever.